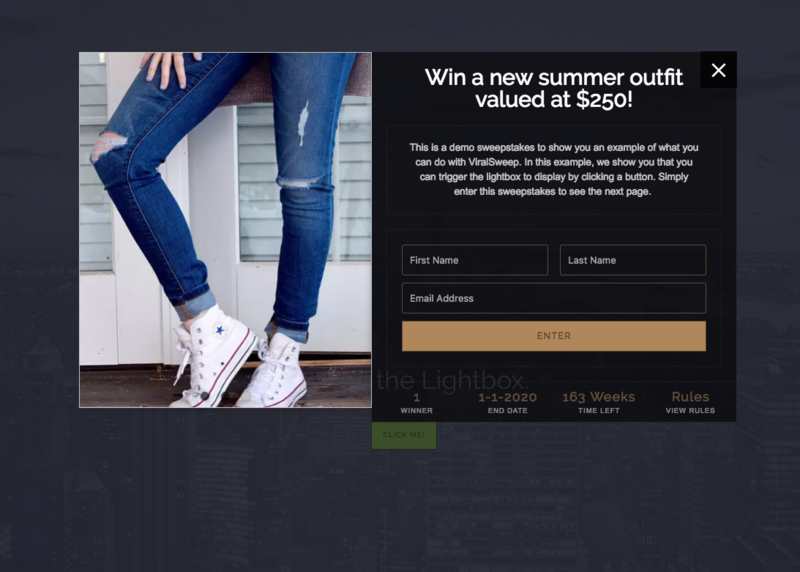 The lightbox places your giveaway on top of your website content to entice visitors to enter. By default, the lightbox will display over the page content when a user visits the page you place it on. You can also trigger the lightbox to display when someone clicks on something. Let's break down the code above. This is the default setting which keeps the lightbox from displaying on page load when a trigger is being used. If you want to have the lightbox display on page load, just change true to false. This is your lightbox code that you will obtain from your ViralSweep dashboard. Take note of the number 256 before the .js portion of the code. This is the campaign ID, and you will need this to invoke the trigger. This is the trigger portion of the code. Where it says "viralsweep_lightbox_256", you will need to change 256 with your specific campaign ID which is found in your lightbox code as shown above. This will create a link people can click to trigger your lightbox. You can of course add an image URL instead, or add a class if you are including a styled button. Still having trouble with our lightbox template? Simply click the support or live chat icon to get in touch with us.